(b) The bob has gained gravitational potential energy mgh = mg×2ℓ = 2mℓg, on moving up from A to B, by losing an equal amount of kinetic energy. The kinetic energy of the bob at B is (½) mV22 = (½) mℓg, since V2 = √(ℓg). (d) When a moving sphere suffers a head-on elastic collision with an identical stationary sphere, the entire kinetic energy of the moving sphere is transferred to the stationary sphere. (The velocities get interchanged). (e) The projectile will momentarily come to rest on hitting the bob and will fall freely under gravity (vertically) thereafter. Since V3 = √(3ℓg) we obtain T3 = 3mg. You can easily show that this difference is 6mg in the case of any vertical circle [even if V1 is greater than √(5ℓg)]. 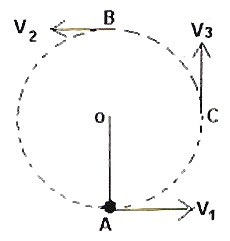 You should remember that the minimum velocity required for the bob at the lowest point A so as to make the bob move along the circular path is √(5ℓg) = √(5Rg), using symbol R for the radius of the circle. You will often find questions making use of this fact.